Fees are kept to an absolute minimum. The enrolment fees and nightly fees are shown on each class page. Nightly fees are the same price as last year, and there is a reduction in the enrolment fee if you enrol for both the Autumn and Spring terms at the same time. The nightly fee is payable each time you attend and is in addition to the enrolment fee, but there is no charge for missed classes. For example, Dressmaking costs £46 to enrol, and you then pay £3 (£2.30 concessions) each time you attend. The enrolment fee will be refunded only if the class is full or cancelled, otherwise it is non-returnable. The enrolment/night fees will be combined for students who enrol for both the Chinese Exercise for Health and Meditation & Massage. The combined enrolment fee will be £46 and the night fee will be £3 (£2.30 cons). Concessionary nightly fees are available to full-time students, those in receipt of means-tested benefits and for people who have reached state pensionable age. 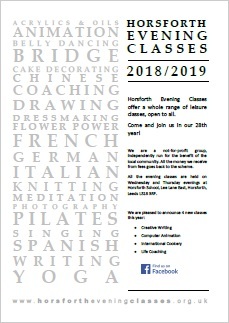 Please note: the classes are open to everyone aged 18 and over.